Our commitment to customer service hasn't. If you're trying us at 604-731-5046 and thinking, "Did they pull up stakes and flee in the middle of the night, starting new lives as a family of singing troubadours in the Andes?" ... the answer is no. We've just consolidated our many phone offerings into one easy-to-manage number: 604-731-5445. Two -- that's right, TWO! -- pages of travel wisdom on Internet travel sites, Aeroplan maneuvering, and must-have doo-dads. Ever notice how Internet video is always jerky, and how the sound never really synchs with the pictures? Finally there's a news station that doesn't even bother trying. Check out our first (and, with any luck, only) newscast (QuickTime, 3.3 MB). August 24 — Turns out there's a sequel! Yep, Sisko's finally swimming. Join the celebration with this little video (QuickTime, 4 MB... aren't you glad you sprung for a fast modem?) video. Bored of your old look? Hoping to make a bald  er, bold fashion statement while saving big bucks on hair stylists and product? 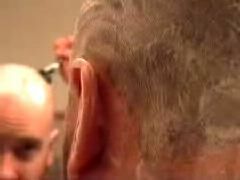 See how Rob did it in a little video we call "Hairless Whispers." Available right here. Never again will go to bed angry...witha partner who foolishly insists that Cher was one of the original Charlie's Angels. IMDB offers complete credits for every TV show and movie in existence, so you can prove that the latest Law & Order episode did feature Chip Zien. Look it up, people. Our real estate agent. She gave us a crash course in the Vancouver real estate market and helped us find the home of our dreams. She also has a wicked sense of humour. Not only are we geeks, we're cross-platform geeks. At one point, Alex switched to a Windows machine (because of the demands of work) and then back again (because there's no place like Cupertino) and Rob switched to a Mac (because he got a great deal). Thanks to this site, we can still talk to each other. Lots more available on Rob's page, Alex's page, Sisko's page, and our together page. Click here to go back to the new stuff! Alex's site for information on her research, writing, and teaching. Rob's site for information on his communication services. are like online journals. Take a look at Alex's Noggin News Network blog, Rob's Raincoast Diaries blog, or start your own blog using Blogger software.